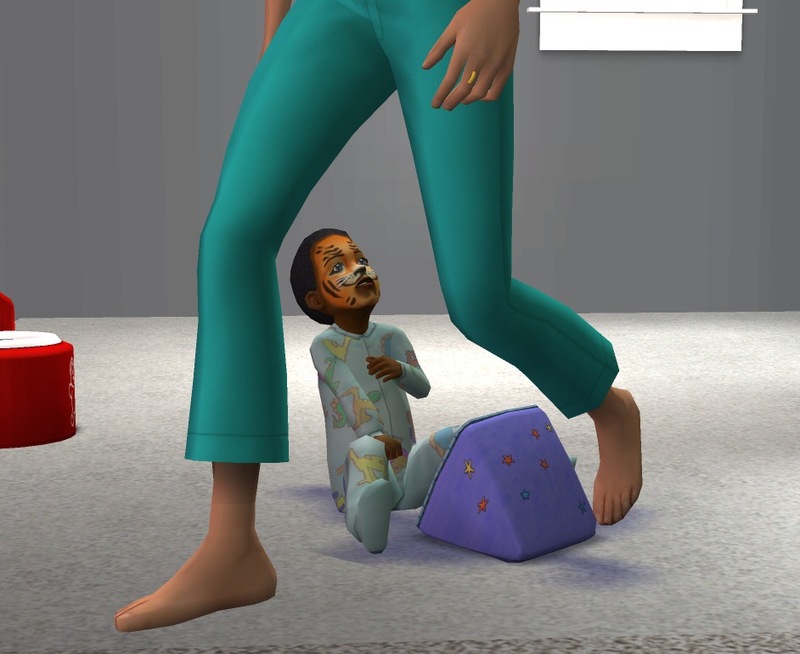 Mod The Sims - New Toddler Mirror - **MAJOR UPDATE 4th March** - Please re-download! New Toddler Mirror - **MAJOR UPDATE 4th March** - Please re-download! ADDED: New interaction for adults: now they can "Join" the toddler when he looks at himself in the mirror. 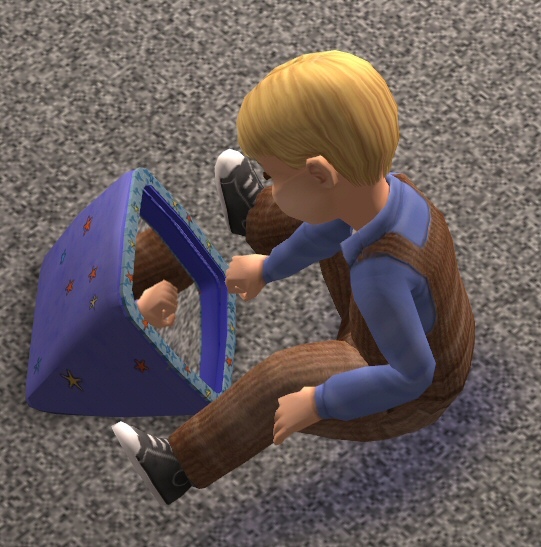 ADDED: The Toddler Mirror can now be "stepped over", like other small objects placed on the ground. FIXED: The colour changing to pink at the end of the "Change Appearance" interaction. FIXED: The interactions can now be correctly canceled. FIXED: The message displayed when the Body skill point is gained doesn't mention any more the "Charisma" skill. FIXED: The Catalogue Description now correctly displays the "+Body" tag (instead of "+Creativity"). Once again, Numenor and myself have teamed up to create a 'brand new' object. As usual, I just made the mesh and textures and Numenor did all the 'magic' in making it a 'usable' object for Toddlers. The mirror has a fully working reflection surface, and can only be placed on the ground (not surfaces) - because the toddler need to crawl to it in order to use it. 1) "Look who's in the mirror!" - This allows your Toddlers to 'play' with the mirror... This included several animations, but, more importantly, playing with the mirror will slowly increase their 'body skill - because your toddler is learning to take care their face (:confused ... and you will receive a custom message once the toddler has gained a body point! 2) "Change appearence" - This works the same as the 'change appearence' for other Sims, and will allow you to change hair, makeup, accessories etc. 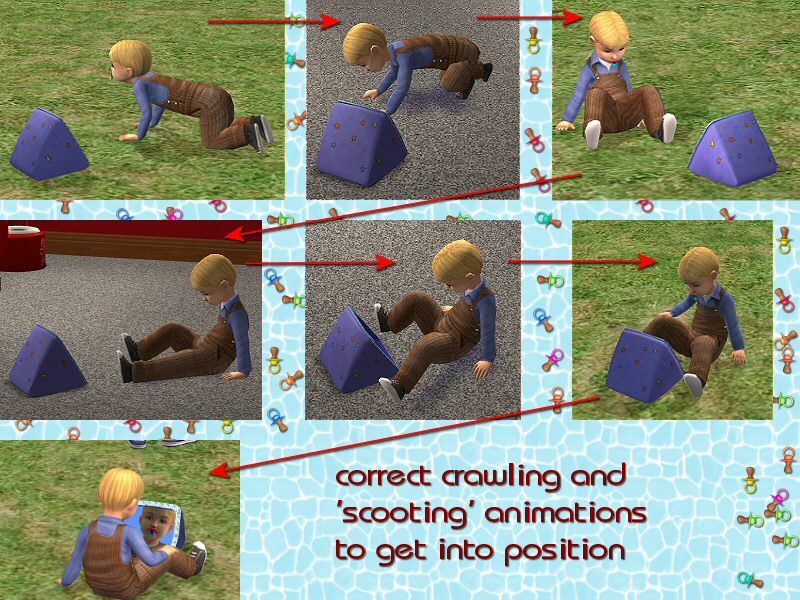 Whichever option you choose, your toddler will crawl close to the mirror...then change to the sitting position...and then 'scoot' up close to the mirror with their legs either side of it. Likewise, when the interaction is finished...your toddler will 'scoot' and crawl away from the mirror. Made with Milkshape SimPE v0.54 it has it's own unique (registered) GUID, is fully recolourable and is compatable with ALL games ( works with or without exapansion pack(s). The single package contain two recolours....'Baby Blue'...and 'Pretty in Pink'. Deleting either of these colours will result in deleting the whole package and consequently the mirror itself. You can change the colour at purchase time or using the design tool. It can be found in the catalogue in Decorative/ Mirrors (for both Residential and Commercial). The real thanks go to Numenor for making this such a wonderful object to use....so please take time to thank him for those things (I just made the mesh/textures. Lots: DO NOT include this item in any Lot uploads. You may include it in your screenshots, but please REMOVE this item before packaging and uploading your lot. Put a link in your lot upload for people to come to this thread to download it. This way, they will be getting the most recent version, which may include any updates since you downloadload it. 5941 people have said thanks to boblishman for this download.